Floyd Field Day is May 18, 2018! We are having a contest for the best Field Day t-shirt design. The winner receives a free Field Day admission and t-shirt. 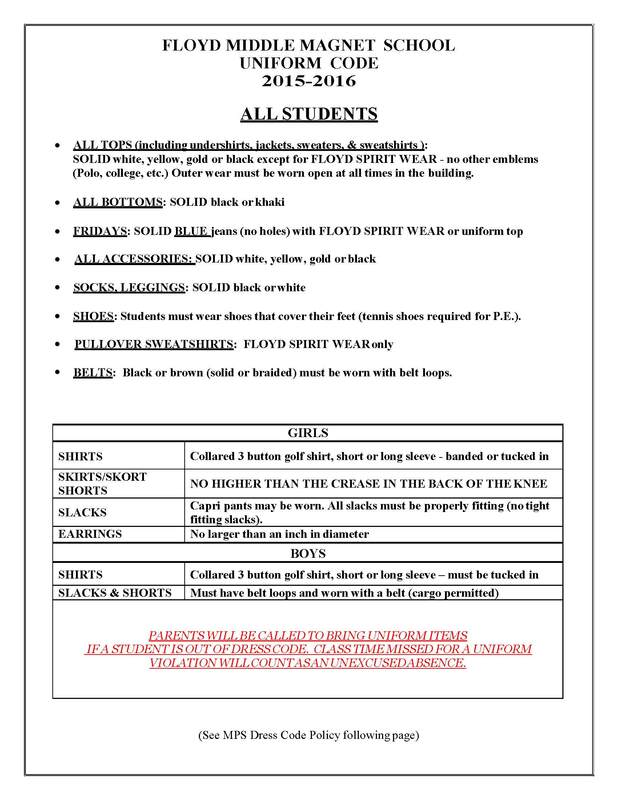 Students should submit hard copies of all Field Day t-shirt designs in the PTSA box in the front office by April 6. The shirt will need to say FMMS or Floyd Field Day 2018 somewhere on the shirt. Students submitting entries should pick one color for the shirt and any color (1) for the design. Entries may include one or two designs. If two designs are submitted, one may be large and the other must be smaller. The Winter Glow Dance will be held on Friday, January 20th, from 6-9 in the lunchroom. Admission is $5 for PTSA members, $7 for non-members. No guests, only Floyd students or parents may attend. There will be music, food, dancing and a contest with prizes for those who glow the most! Pizza, nachos, drinks, pickles, and candy will be sold for $1 each. Glow items will be sold at the dance. Volunteers are needed and appreciated to help with concessions, chaperoning, and clean-up at the end of the dance. Please contact Stacey Lancaster (pamoja75@aol.com or call/text at 205-527-6275) to sign up for a volunteer shift. 1st shift is 6:00-7:30 and 2nd shift is 7:30-9:00. For your child’s safety during this event, parent & teacher volunteers will be monitoring doors, parking lots and bathrooms. Children must stay in the lunchroom and will not be allowed to wander the parking lots or school halls. To pick up your child after the dance, you may park and walk into the lunchroom or may call/text your child when you are close to the school. Please enter the parking lot from Augusta Avenue to pick them up. Mr. Brown is asking for FBLA or parent volunteers to help with the Fall Festival this Friday. Other events include a “tattoo” parlor, football kick and toss, soccer penalty kick, boys and girls basketball shootout and many others. The rain date is Thursday, November 10th. If you need additional information, please contact Mr. Brown @thomas.brown@k12.al.us. guests, only Floyd students or parents may attend. drinks, pickles, and candy will be sold for $1 each. Augusta Avenue to pick them up. Don’t forget to stop by the Book Fair this week which runs through Friday, May 16th. Open during school hours. Students, and parents, are encouraged to come by and stock up for summer reading! Cash only, no checks, no credit cards.